We just reported on the debut of the Tiida in Shanghai, but Nissan has now unveiled the 2012 Nissan Vera at the opening of the 2011 New York Auto Show. 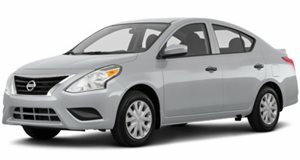 With a starting price of $10,990 and impressive fuel economy ratings, the new Versa may not be a Prius but it&apos;s certainly a great buy. This is exactly what Nissan is going for by branding the Versa with its new and catchy Pure Drive efficiency label. The vehicle is powered by a 1.6-liter DOHC four-cylinder engine, and will be the first Pure Drive vehicle in the US. Nissan spokespeople have also claimed that the Versa is already the bestselling car in its segment. With gas prices the way they are at the moment, and in the foreseeable future, a 33 miles per gallon combined fuel efficiency rating is a strong selling point for this car.